A prefabricated fence that has 12 horizontal twines (11 conductive); is 48" tall installed, and has string verticals every 3". 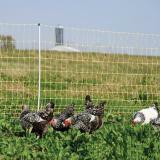 Keeps in chickens, ducks, geese and other poultry while keeping their ground based predators out. How does it compare to PoultryNet? 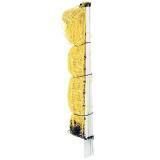 Not as easy to handle during removal and installation (longer length between posts means more material to fold/roll). To contain and control the movement of chickens, ducks and other poultry. 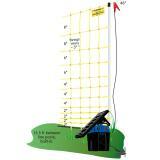 To prevent raccoons, coyotes, foxes, bears, dogs and other nonflying predators from killing poultry. To rotate poultry to fresh grass and to reduce disease risks. Vertical Strands Plastic strings spaced every 3"
It has 380 ohms of resistance instead of 38 so it’s not advised for fences longer than 2 to 3 nets. Recommended: 7 out of 8 said they would recommend this product to a friend. The only thing I’m disappointed in it sags way too much going to have to use PVC to hold it up. This is my eighth role, I continue to buy this because it’s outstanding! I have goats, I buy the poultry netting because it keeps the kids in. Love it love it love it! Bought 2 164ft sections of netting to keep our 120 pasture layers contained and safe from ground predators. So far it has worked great! We are not using any extra posts and it seems to work just fine. No one is flying over at this time yet either. Thanks for the quality product and fast shipping! Will be buying more netting as we expand our pasture flock over the coming months and years. Keeps poultry, goats, pigs, and horses in as well as keeps the deer, coyotes, and racoons out. Easy to move to rotate pastures. Does require extra post on corners and at beginning/end. Had up over a year, thru the winter with no issues. Great to deal with. Fast shipping, just a pleasure!